Simply upload a video of yourself reading a chapter from any book in the Circles of Heck series (Heck: Where the Bad Kids Go, Rapacia, Blimpo, Fibble, Snivel or Precocia) and win a signed copy of a Circle of Heck book. If your video reenacts a scene from a Heck book—puppets, animation, etc.—you’ll receive a special prize in addition to a signed book. Send links to heck@wherethebadkidsgo.com. Contest ends September 7th! It happened again today, didn’t it? Something so unsettling and so, so… WRONG, but the offender just skipped away leaving you soaking in your own rage. 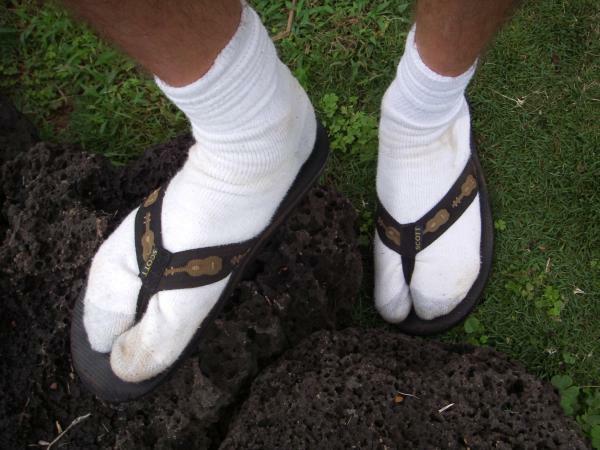 Yep, another guy wearing white socks with sandals. Why, there ought to be a law against that! Well, lazy pants, stop talking and start legislating the world around you in your own, infinitely-right image! Murphy had a law, so why can’t you? Start by taking a little initiative and making one. An initiative is a proposed law placed on the ballot as the result of a petition drive among registered voters, then voted on by the electorate (i.e. : the sheep that will soon bow to your will and make the world an aesthetically better place, at least in terms of men’s casual footwear). Be sure to word your initiative in such a way that it comes off like it will help other people too (“Think of the needless accidents that happen each day just because a driver’s attention is diverted by a pair of brilliant white cotton socks.”). But it’s not quite as easy as just being charming and persistent outside of a supermarket, gathering signatures like a bee gathers pollen. Each state has its own laws regarding potential laws. Arizona requires that each petition have only 15 signatures per page or else the whole jig is up. Other states require signatures from a percentage of voters in every region of your state: even the icky ones where the Starbucks are at least a mile a part. Ballot measures are notorious for being confusing, so go for it: all those episodes of Law and Order didn’t go to waste. Use a lot of Latin: Quid pro quo. Ipso facto. Habeas corpus. Pro bono (as if U2 weren’t popular enough already!). • You have to be at least 25 years old (easy for all too many of us, not so easy for some). • You have to have been a US Citizen for at least seven years (or one year for dogs). Every candidate needs a platform, or better yet, a soapbox. Just make sure your soapbox is made of sturdy oak, not balsa wood. Think of yourself as a product to be pedaled. Don’t slouch. Maintain eye contact. Try your best not to perspire. Become the person that intimidates you the most. SELL! SELL! SELL! And be sure that what you stand for makes others stand up and take notice (“The egregious pairing of sandals with socks is fundamentally un-American, and a dire threat to the moral fabric of this great nation!). Media culpa? You bet! Get on the airwaves, get in the press, and do whatever you can to get your name out there (ideally, not in the police blotter). Send out press releases. Speak on radio, cable access, bowling alley openings, etc. Then there’s paid advertising where you have more control, but not without a price. Do you think all those flyers grow on trees? Well, sure, they did but…anyway, it all costs enormous amounts of cash, green stuff, dinero and sometimes even money to lube the campaign machine. You’ll need lots of it to keep your dream alive, and the socks in the shoes where they belong. What’s next? You either win and draft a bunch of laws regulating men’s fashion for the public good until your constituents figure you out, or take matters to the next level. If your subject’s mental state is, say, less Texas and more Rhode Island, the whole process should take only a few minutes. To ensure that no sandal is again ever sullied by a sweat sock, try hypnotizing as many people as you can in one sitting. Place prominent ads promising “Free sandals and socks!” if attendees attend your free “seminar.” Next thing you know, you’ll have a gym packed with hundreds of people, twice as many feet, and thousands of toes, and you’re sure to pass some legislation that will really knock their socks off!